Many businesses have already embraced the benefits of going fully digital and it has saved us time and eliminated the need for stacks of file cabinets in every office. But the digital boom presents us with a brand new range of issues. By moving all our files into a digital space, the amount of storage we need to maintain has grown larger and larger. As digital technology has improved, the resolution and thus the size of the digital files we create has exploded. Items such as photographs, which used to be printed on film are now digital files stored and transferred by computers. As a result of the increase in both the number of digital files we use and their ever-growing size, the size of the data we need to store and backup has exploded exponentially. This blog lists a number of ways in which we can tackle our ever-growing storage problem. A local server is a high end computer system machine designed to serve many files to multiple clients at one time from locally held storage. The advantage that a local network server has is that all your vital data is available to all users in one central location. This means that all employees on the network can access all the resources made available. These machines can serve files at the speed of the local network, transferring large projects, files, and documents from a central source within the network quickly and with ease. A Network Attached Storage device (or NAS) has many of the same network properties but in a smaller more compact profile. These can be available in units small enough to fit in a cupboard nook and yet still provide staggering storage capacity on only a small amount of power. Both of these units can often be expanded with more and more storage, so as an organization grows over time its storage requirements are met. 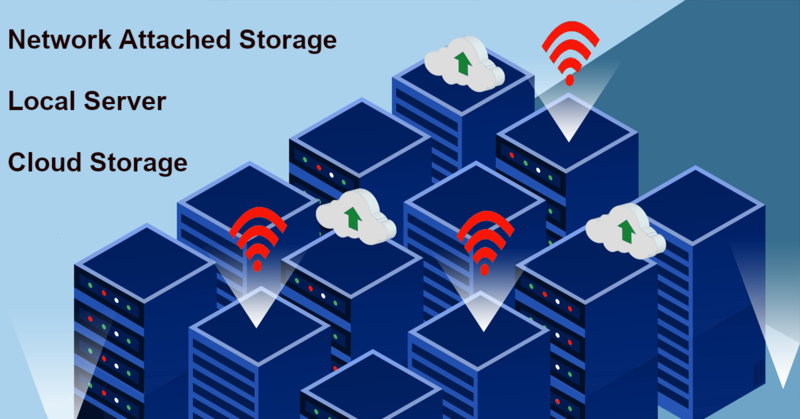 Sometimes the best option for storage is to move your ever-increasing data outside of the business and into the cloud. Offloading the costs of hardware and IT management can work out to be an intelligent business decision and one that provides freedom and flexibility for your data storage needs. The real advantage of cloud storage comes from the ability to expand and contract your services as needed without the overhead of adding and maintaining new hardware. By moving storage to the cloud, data can be accessed from anywhere in the world allowing limitless expansion to any number of devices, locations and offices. Being able to access data from many locations at a single time can often provide a valuable boost to productivity that can help to improve productivity. Some drawbacks of cloud storage come from factors that may be outside of the control of the business. Not all businesses have access to internet connections that are fast enough to handle large amounts of data transfer to and from the cloud. Local laws and security regulations can prove to be a barrier to enabling storage in the cloud too. Some regulations either prohibit the feature entirely or enable only certain specific types for use. Whatever your situation, whether a small NAS, server or cloud, we can advise on the best choices for your business. Contact us on 08 8326 4364 or support@dpcomputing.com.au to allow us to use our expertise to make the right choice for your data. This entry was posted in Cloud, Hardware and tagged adelaide, cloud, data storage, dropbox, google drive, local server, nas, network attached storage, onedrive, sharepoint, south australia by David Perkovic. Bookmark the permalink. Pingback: How Safe is Your Company Data in the Cloud?